Bridges are ideal for people who don’t like dentures and only have one or two teeth missing. 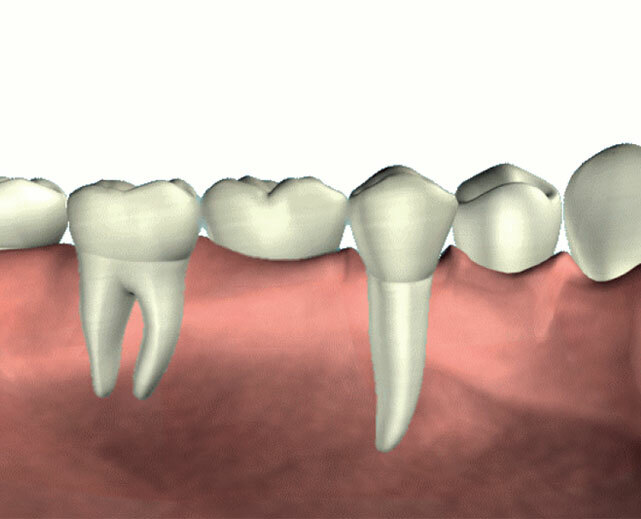 Bridges are usually made by crowning the teeth on either side of the gap and attaching a false tooth in the middle. They are fixed in the same way as crowns. These bridges are usually made of precious metal bonded to porcelain. Sometimes other non-precious metals are used in the base to give it extra strength. A Bridge can conceal the fact that you have a missing natural tooth. The space may be filled with a fixed restoration that still looks and feels like a natural tooth. The surrounding teeth need to be suitable for this. A bridge may also be recommended to replace an old bridge or one you are unhappy with. There are several considerations to think of when there are missing teeth. A bridge can benefit you in a variety of ways. Replacement of a missing tooth can improve your smile, whether the missing tooth is at the front or side of your mouth. It can help your bite, otherwise known as occlusion, by providing support and preventing other teeth from drifting into the space. This means you can speak, eat and chew more comfortably. Bridgework can also be suitable to replace small partial dentures. Decisions regarding bridgework need individual assessment. 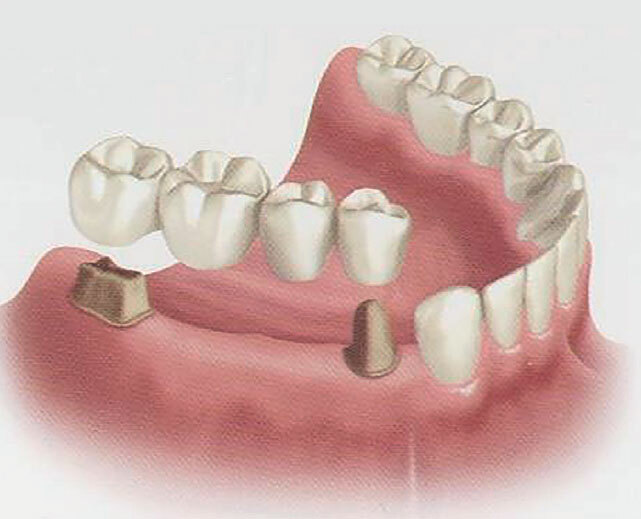 Fixed bridge - The replacement tooth is joined to crowns on either side of the space. 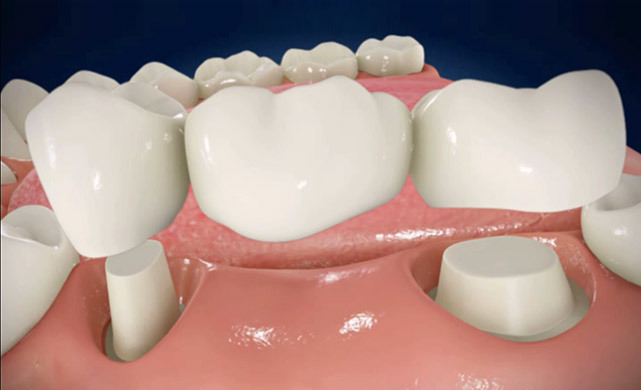 This type of bridge can replace more than one tooth. Resin-bonded bridge or Maryland bridge - The replacement tooth is made of porcelain, and is fused to metal wings that are bonded to the adjacent teeth and hidden from view. 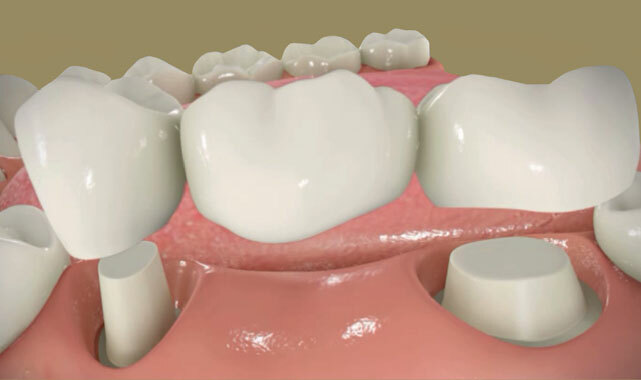 Cantilever bridge - The replacement tooth is anchored to one or more adjacent teeth, only on one side of the space. What steps are involved in getting a bridge? As with a crown, this is normally carried out in two appointments. During the first visit your teeth would be prepared, impressions taken, and temporary bridge placed. A temporary bridge is fitted, with good aesthetics between appointments. At the second visit, around a week later, the temporary bridge is removed and the final bridge tried in, adjusted and cemented in place, providing you and your dentist are happy with the fit and appearance. Can I have a bridge attached to my jaw bone? Yes but this would involve implant treatment. If this is something you are interested in please Ask our Dentist today to find out what dental implants can do for you. Like a crown Bridges require you to maintain a good level of oral hygiene. The dentist or hygienist can give you individual advice. The dentist takes an impression at the Bridge Prep appointment which is taken to the dental lab where a highly skilled technician then makes your bridge, in the material, design and shade your dentist specifies. 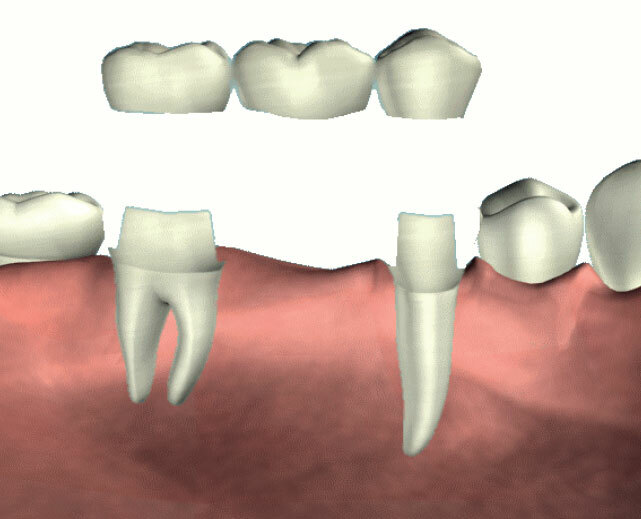 Our Dental Bridge prices vary depending on type of bridge and number of teeth, or units. What if I don't want my remaining teeth drilled? 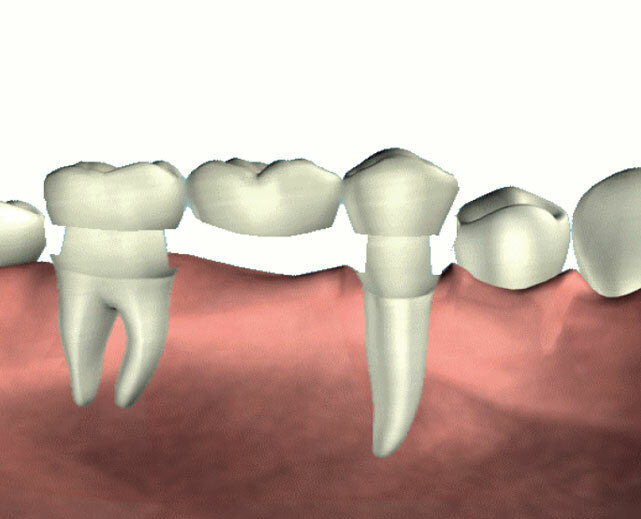 Adhesive bridges or Maryland bridges are another way of bridging a gap, and less of the tooth needs removing. These bridges are made up of a false tooth with metal ‘wings' on either side. These wings are made to bond to the teeth on either side, with very little drilling involved. 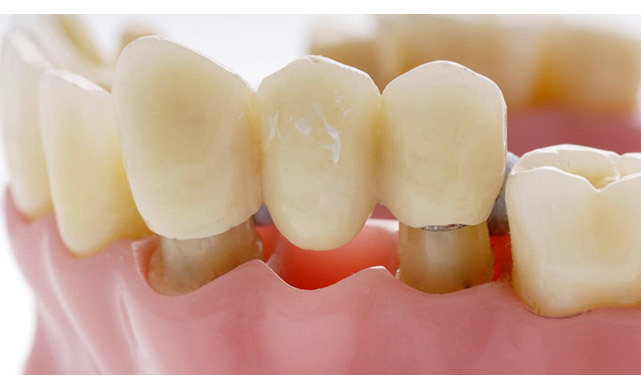 Instead, the teeth are roughened and the bridge is fitted using a very strong composite resin. Bridges are only possible if you have enough strong teeth with good bone support. Your dentist will help you decide which is the best way of replacing missing teeth.